Apple has expanded Keynote’s repertoire with several new action builds, including Move, Rotate, Scale, and Opacity. The most significant is the Move action, also known as an A to B animation (a feature that Microsoft PowerPoint 2004 lacks). Using this effect, you can make objects travel along a path you define. Start the Animation First select an object, and then head to the Build Inspector’s Action pane (select View: Show Inspector, click on the yellow diamond icon at the top of the palette, and click on Action). Choose Move from the Effect pop-up menu. A straight red line with diamonds on each end will appear. This line connects the original object to a translucent copy that represents the anima-tion’s finishing position. You can drag either diamond to change where the object starts or finishes. If you prefer a curved path to a straight one, click on the Curve button (its icon is a little arch) in the Build Inspector (under Path). The red line will change to a curve with a control point in its middle. If you click on this point, Bézier handles appear, allowing you to change the degree of curvature; dragging the point stretches the curve like a rubber band. To create a more complex curve, option-click anywhere on the path to add a new control point. Add On If you plan to move your animation along multiple lines or curves, you’ll need to insert additional paths. At the end of your current path, you should see a diamond with a white plus sign (+); click on the plus sign, and a new path will appear. Continue adding and modifying paths until you get the animation you want. As you create new paths, previous ones appear as dotted red lines, so you can view the entire course of an animation (see “Animation on a Path”). Animation on a Path: Keynote’s animations can now zig and zag, as well as travel in a straight line. Click on one of the red diamonds to adjust the curve. You can also apply more than one action build at a time. For instance, you can make an object grow or shrink as it moves across a slide. After you’ve created an action build, you can click on the Add Action button in the Build Inspector’s Action pane. Select Scale from the Effect pull-down menu in the drawer that pops out of the Inspector, and use the slider to set how much the object grows or shrinks. To make the Scale action and the action you’ve already set up occur simultaneously, go to the Build Order drawer and select Automatically With Name Of Previous Build from the Start Build menu. 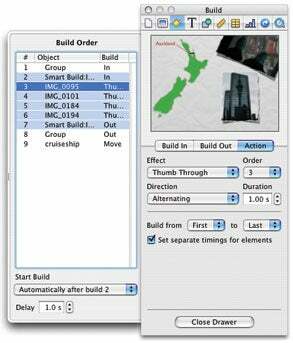 Check It Twice To preview your work, go to the Build Order drawer, where each path is listed as a separate build. Click on a build to see a preview of the animation in the Inspector. (If you don’t see the drawer, click on the More Options button at the bottom of the Inspector.) By default, Keynote arranges things so that a mouse click triggers each build during the presentation. If you want to create one smooth animation, go to the Start Build pop-up menu in the Build Order drawer and choose Automatically After Name Of Previous Build. Sometimes you need to include more than one image on a particular slide. For example, imagine a political presentation in which every slide focuses on a different office and runs through a picture of each candidate, one at a time. In past versions of Keynote, displaying a series of photographs or illustrations—with flowing animation between each image—was possible but a hassle to set up. For every photo, you had to create both a build in (to make the image appear on the slide) and a build out (to make way for the next image). Keynote’s new Smart Build feature streamlines the process considerably. Begin to Build Select Insert: Smart Build, and choose from ten preset animations, including Dissolve, Flip, Spinning Cube, and Turntable (similar to the animations in Front Row). When the floating photo window appears, drag and drop images from the desktop or use Keynote’s Media Browser (View: Show Media Browser) to pull images from your iPhoto library. Customize It This is a great point at which to take advantage of another of Keynote ’08’s new features: Picture Frames. These are a special kind of graphical stroke that you can add around your photos to give them a particular look. For example, one picture frame adds a white border with old-fashioned photo mounts at the corners, and another makes your picture appear to be inset into the slide’s background. You have a choice of 12 different Picture Frame effects. Quick tip: Although Apple only shows you 12 Picture Frames, there are really 72 Frames hidden inside Keynote. See instructions on how you can access all of them. To add a Picture Frame, click to select the photo on your slide, then open the Graphic Inspector. In the Stroke section, choose Picture Frame from the pop-up menu. Click on the frame thumbnail, and then pick the frame you want from the frame gallery that appears. Finally, fine-tune your frame by using the Scale, Color, and Size controls (the latter two only appear in a few frame types). Custom Durations: When you’re constructing a smart build, use the Delay field in the Build Order drawer to set how long individual images appear on screen. In the Build Inspector’s Action pane, you can specify the animation’s direction, duration, and other attributes. You can also set different display times for each image: in the Inspector, select the Set Separate Timing For Elements option. Each photo will appear on its own line in the Build Order drawer. Click on the first photo’s line, choose Automatically After Previous Build Name from the Start Build pop-up menu, and set a display time in the Delay field (see “Custom Durations”). Once the smart build is on the slide, you can treat it like any other object. That means you can set it to enter or exit the slide with a swoosh or a wipe by applying one of the effects in the Build Inspector’s Build In or Build Out panes. But there are some limitations—you can’t move a smart build along a path, rotate it, or scale it, for instance. Also, since you can choose only one animation effect for the entire set of images, you’ll have to use an action build, or regular build-in and build-out effects, if you want to apply a different kind of animation to each photo. 1. Does this animation help make my point better than words or images would alone? 2. Will the animation make it easier for my audience to understand the idea behind the slide? 3. Does the animation underscore what I’m saying? Good presentations aren’t about the slides or fancy effects. They’re about your message. So don’t use an animation if it’s going to distract people from the real significance of your ideas.